A peacock mantis shrimp emerges slightly from its burrow to investigate the approaching photographer. 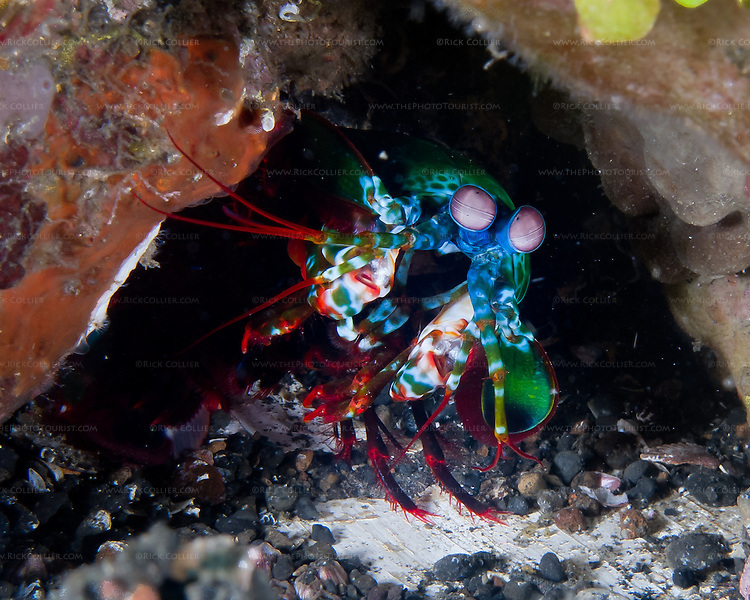 Mantis shrimp are curious and will sometimes come out of their burrows to investigate a passing fish or diver. They are active predators that hunt primarily using their excellent vision in the daytime. Mantis shrimp are not actually related either to shrimp or mantoids (which are insects), but are named for their appearance, which resembles both. They are usually approachable and not particularly dangerous to divers, but care is still needed: Mantis shrimp are also called "thumb splitters" for their ability to inflict a deep wound if they feel a need to defend themselves (easily penetrating a wetsuit or, rarely, a camera housing).